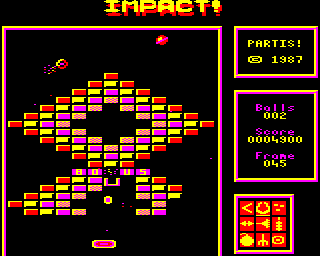 MODE 5 is a low-resolution screen MODE, introduced on the BBC Micro Model A and supported by the entire BBC series including the Archimedes. It allows colour graphics to be shown while leaving 15 KB or more free for programs; however to achieve this there are only 20 character columns on screen. In Elite and Revs a custom interrupt routine splits the screen in two; the bottom half is configured as MODE 5 to show the dashboard and add colour. The MOS provided features that made it easy to simulate double buffering on the Model B. While one bitplane was being displayed, the other could be hidden (by setting it to the background colour), undrawn and redrawn. Battle Tank (Superior, 198?) is an example of a game that used this technique. Acorn went on to implement true double buffering in the Master and Archimedes. This page was last modified on 12 October 2016, at 20:23. This page has been accessed 3,599 times.